Here is our interview with Tom Staar. Hi I’m Tom Staar. I’m a DJ, producer, studio engineer and promoter from the UK. 2. When did you start to approach the music? I knew from a very young age that I wanted to be a DJ or something to do with Dance music. I began really getting into the production side of things in January 2000, and from there my DJ career began. 3. And what about your “uniform”? Why the choice of the helmet for example. When I first started the Tom Staar project I had a cartoon character designed for my MySpace and made up a story about being from space. Once the name began to build I wanted to keep an element of the character but also be able to be myself, so the helmet idea came up. 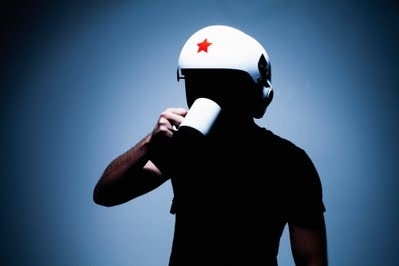 I have my headphones fitted inside it and at bigger festival type gigs I DJ wearing the helmet which is cool. 4. Describe us the process that leads to the creation of your song. I normally begin a track by listening to other records that are really doing it for me at the time. I normally begin by getting some drums down, then maybe a bass line or lead sound. Once I have all my sounds together I begin on the actual arrangement of the track. I normally spend 2-3 days on my own tracks. 5. What about MODA? How did it happened? Moda is a new music brand that I set up around 5 years ago with Jaymo, Andy George and another friend called Ben. It was originally just a club night that we ran on monthly Fridays in our home town of Lincoln. Over the past few years we have expanded the events side of things to the point where we now have around 5 venues in the UK that we do events at, all of 1000 – 2000 people, they pretty much always sell out! We also have been running events in Ibiza for the past two seasons and now also have the Moda Music record label that is flying right now! 6. What’s the plans for 2011? This year I want to really start concentrating my efforts on my Tom Staar productions. The last few years I have done a lot of studio engineering work for many artists including Doorly, Jaymo & Andy George, Prok & Fitch and many others. This year will see me hopefully doing less of that and more of my own work. Also I will be continuing to tour my DJing and maybe begin looking at a live performance show. Besides that I we will continue building the Moda brand musically and with bigger and bigger events. 7. We’ve finished. Greets the readers in your preferred language and suggest us a song. Hey everyone, thanks for taking the time to read my interview. If you don’t know my music check out my latest EP on Moda ‘Tom Staar Pandemonium EP’. A track I’m really feeling at the moment is Jan Driver – Gain Reduction, totally destroys the clubs.